Part four in this post covers our brief vacation in Switzerland. We stayed in Interlaken and made day trips to places of interest. We decided to find parks and fun activities for Baby as well. DAY 5: Evening: We headed out of Schaan, Liechtenstein, and drove to Interlaken and checked into a fairly cheap hostel on Hauptstrasse that has private rooms for groups. Rested the night and decided to explore the Berner Oberland region. 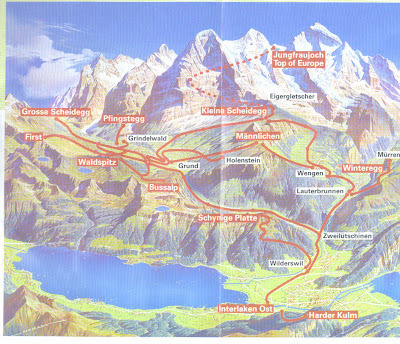 DAY 6: Went to Grindelwald, walked around and enjoyed the scenery, the cows, the rolling hills, the not-so-far-off Alps. Then, we headed over to Lauterbrunnen. Walked around drinking in the beauty of the region, the Lauterbrunnen church, the waterfalls... then rode the bus to Trümmelbach falls. The glacial water melts and flows from mountain peaks, crashing through rocks and carving its path downward at the Trummelbach Falls. We took a tunnel lift (like miners used) up and into the mountain, and followed the waterfall on its roaring and powerful journey down. There are man-made tunnels and pathways to view the falls, and some strategic lights help realize their awesome force. Baby seemed to love this even though initially I feared she might get terrified by all the noise and force of the waterfalls. And she wanted to ride again in the tunnel lift! We had a simple lunch of pretzels, bread, cheese, apricot cake, danish and some coffee. Then decided to let Baby have some fun at a nearby park. She loved the wooden horses, the tree house, the swings and didn't want to get back in the car to drive back to Interlaken. It is impossible to do justice to the stunning beauty of the Lauterbrunnen valley using mere words and pictures... the U-shaped valley is apparently the world’s deepest with about 70 waterfalls, it is simply spectacular. 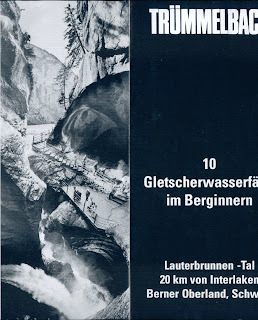 Next time (whenever that is), D and I decided we would stay in Lauterbrunnen rather than Interlaken or Grindelwald and explore the Berner Oberland at a more leisurely pace, chatting with cows, sampling local cheese and such. Most of these areas are car-free but allow parking near train stations so one can get around fine. And, next time, we are going to visit off-season when the prices are dramatically lower compared to the summer prices we saw! We reluctantly waved good-bye to the Lauterbrunnen valley and went over to Lake Thun. It was gorgeous and serene, reminded me of Slocan Valley in B.C., Canada. We let Baby loose at a kids' play area, full of kids of all ages squealing and having fun. Had some coffee and rested a bit enjoying the scenery while Baby played on. As it was getting close to dinner time, we headed back to our hostel in Interlaken. Freshend up and walked across on Hauptstrasse to get some dinner. I had Swiss Rösti and D had some local dish (the name eludes me now) and baby had some pomme frites type kids' meal. Then we walked around town a bit and hit the sack wonderfully exhausted. DAY 7: I went out to window shop and ended up getting some little souvenirs, couldn't resist - how can I not get cowbell souvenirs from Switzerland??! Anyway, then, we were curious about the Mystery Spot and wanted to check it out, but, as we got closer, it was clearly closed and under construction, so, Mystery Spot shall remain a mystery for us. Then, we headed to the beautiful city of Bern. We hit the city right about lunch time, so parked the car in Old Town and walked on Kramgasse, featuring many "Baroque façades stuck on to the medieval arcaded buildings early in the eighteenth century", as the brochures describe it. At no. 49, Kramgasse, was the Einstein House, "the apartment and workplace of the famous scientist, who developed his Theory of Relativity in 1905 while working in the Bern Patent Office, having graduated fom the Zürich Institute of Technology a few years before", as the brochures eloquently put it. Kramgasse has many fancy and beautiful fountains, and an armored bear holding the standard of the city’s founder, Berchtold von Zähringen (dating from 1535). We got some late lunch and coffee... it was getting close to tea time when we decided to head back to Darmstadt as the car was due back at the rental by 8p.m or so that evening. 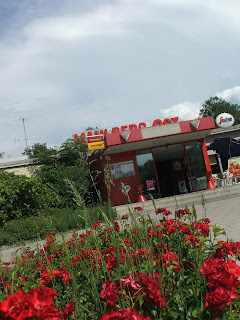 On our way to Darmstadt from Bern, we stopped at this rest stop. Now, rest stops are rest stops, right? Wrong! Not this one. 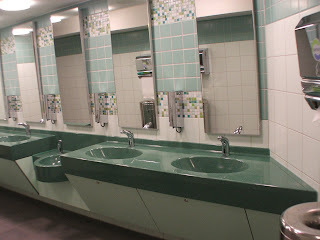 It had plush bathroom, wonderful art on the wall, large buffet/salad bar type food place, a terrace to sit out and have some drinks... plus, here's what I really appreciated: a gorgeous, roomy, well-kept changing station for Baby. 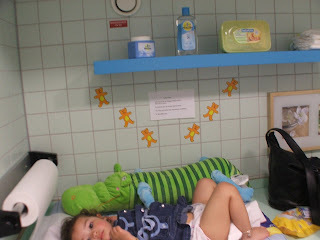 It had a wide "table" along the wall, plush with a soft bed, and a cuddly alligator toy, with of course the mandatory sanitary paper roll to place over the bed, and some diapers, wipes etc. 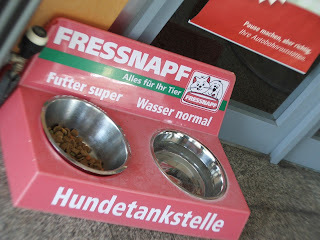 (Of course, I am too picky so I use my own for my baby...) And the rest stop also had a little pet food and water set out at the entrance! We reached Darmstadt on time to return the car and spend the night at my aunt's before heading out for the next leg of our vacation.